Such unplanned power consumption is a huge expense for building owners and property-management firms. A report by the U.S. Environmental Protection Agency’s Energy Star program estimates that 30 percent of electricity in commercial buildings is used inefficiently. Virginia’s largest commercial real estate firms are tackling the problem head-on, coupling automated energy-management systems with human oversight and data analysis to diminish their carbon footprint, curtail expenses and practice sustainability. Liberty Property Trust has installed a building-wide area network that tracks each megawatt of electricity at its 1.2 million square feet of commercial office space in Hampton Roads. The real-time system is like a stethoscope that “lets us hear the heartbeat of our buildings,” says Craig Cope, a vice president of Liberty’s Virginia operations. The tracking doesn’t stop there. Liberty hires private rate-consulting companies to perform an annual audit of its energy usage. The audit helps in obtaining a favorable rate structure and enables the company to avoid times of peak demand, which can lead to higher electricity rates. Another benefit of automation? Instantaneous monitoring. The real estate company can make adjustments as needed rather than waiting 60 days for a bill to detect surges in energy — and the resulting consumption charges. Since installing a smart system in 2008, Liberty has cut energy costs at its 13 suburban office buildings in Hampton Roads by more than 25 percent. “We can’t control the price of energy, but we can control how much energy we use,” Cope says. The rising cost of electricity generation, plus a push to “go green,” is prompting other companies to examine more closely their consumption patterns, says Dwayne Faria, a vice president in Richmond with Cushman &Wakefield |Thalhimer. The average electricity cost for commercial buildings in Virginia is about $1.90 per square foot, Faria says, citing data from the Chicago-based Institute of Real Estate Management. Combined with Energy Star’s 30 percent estimate on inefficient use, it means Virginia companies are potentially wasting 57 cents of every $1.90 they spend on energy. “On a 100,000-square-foot building, that equates to $57,000 a year that comes right off the bottom line,” Faria says. Automated energy-monitoring tools came into vogue in the 1980s, but the sector has seen dramatic changes since that time. For years, a handful of vendors dominated the industry, including ABB Ltd., Honeywell International, Johnson Controls Inc., Schneider Electric and Siemens. Recently, however, a spate of startups, combined with “expanding offerings from traditional providers has created an incredibly confusing market” for commercial energy consumers, according to a 2013 report by Groom Energy Solutions, a Salem, Mass.-based consulting firm. Groom’s report estimates more than 200 companies now offer energy-monitoring software products. The sophisticated browser-based systems collect and store data on virtually every aspect of a building, including lighting, heating and air-conditioning systems, even temperatures of individual zones within a building. Should the outdoor temperature drop significantly, for instance, a system could be programmed to pull ambient air into a computer room automatically, thereby reducing the load on the cooling system. “That cuts down on running dual systems and therefore lowers energy consumption and costs,” says Julie Alexander, director of asset services for CBRE | Hampton Roads. Another example: motion-based occupancy sensors that activate the lights when someone enters or leaves room, or trigger the electricity to be turned off when a room isn’t in use and fires it up when events are scheduled. High-end automated systems are a standard feature in new buildings, providing property owners and leaseholders with a single glimpse into — and greater control over — discrete systems, such as elevators, exterior and interior lighting, building security, fire suppression and others. “Everything that’s controllable and electronic can be monitored,” Faria says. Computer automation provides a way for property managers to account for “building drift,” says Nino DiCosmo, the president and general manager of Richmond-based Tridium Inc., an open-source software company that is part of Honeywell International Inc.
“Building drift refers to how a building’s use starts to change over time. Companies alter their attendance polices so more people can work from home. They add hours or change shifts. Having an automated framework in place lets the proprietor know when the building starts to drift, so he can reset the parameters accordingly,” DiCosmo says. The ability to analyze data incrementally is where these tools really shine, says Joyce Mihalik, director of energy management for Cleveland-based Forest City Enterprises, whose Virginia holdings include 700 multifamily high-rises, Ballston Common Mall in Arlington and a 34 percent interest in Short Pump Town Center in Henrico County. “Automation enables you to act. Without it, you aren’t able to make necessary changes at a facility, even if you know what the real problem is,” Mihalik says. To help reduce its energy consumption by 20 percent a year through 2020, or an average of 2 percent a year, Forest City uses software by EnergyCap, based in State College, Pa., to capture monthly billing and consumption data. “We then analyze that data to look for any anomalies from past trends. We’ll make an issue tracker so we don’t lose sight of it,” Mihalik says. In addition, Forest City has installed data loggers on its energy meters for a “microscale” view of how disparate systems behave in real time. As does Liberty Property, Forest City wants to sidestep peak energy demand, which can “make a significant mark on getting our overall bills down,” Mihalik says. Just as commercial real estate firms do, Hilton Worldwide keeps an intense eye on its energy costs, including day-to-day — even minute-by-minute — electricity consumption. The global hospitality company, based in McLean, in 2009 implemented a proprietary energy-management platform for all properties under its flag. Known as LightStay, the system tracks 200 core disciplines around sustainability. LightStay has earned certification for environmental management from the International Organization for Standardization. The system is a “brand standard” within Hilton, says Randy Gaines, its vice president of engineering for the Americas. Hilton doesn’t require its hotel franchises to purchase the system — at least not yet — but at a minimum, each property must record monthly data on energy, waste and water bills. Hilton won’t disclose how much it invested in LightStay, but Gaines says the system has paid for itself through cumulative savings of $253,000. Automated energy-management technologies vary widely in cost, based on the level of control and features a property owner desires. “You could do a really small project for $10,000 or spend upwards of $2 million or more. It all depends on the size and scope,” Mihalik says. A building’s age also affects the installation price. Suburban office buildings from the 1980s or earlier are expensive to retrofit, which is why building owners often take a phased-in approach. Regardless of the project’s scope, the real goal is to recoup the investment as quickly as possible. “One to five years is usually a realistic time frame,” says Alexander, of CBRE | Hampton Roads. 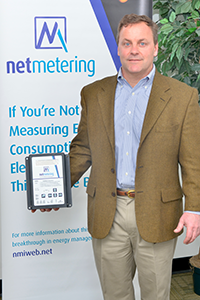 Net Metering’s energy monitoring and audits start at $150 a month. It also will install energy-management hardware in a building, including a Web server and cellular modem, for $2,500 and up, depending on the degree of sophistication and integration.